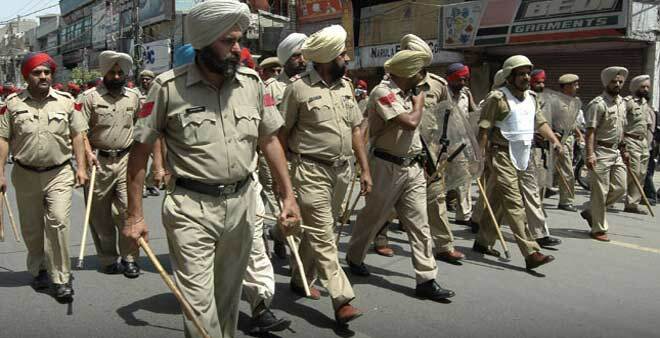 Police stride through streets in Punjab after Sikh religious summit. Amritsar, Punjab: Nov. 17, 2015 — After mass arrests of organizers and participants in a Sikh religious summit hosted in Punjab, India, authorities have filed sedition charges against several, including four American Sikhs. A North American Sikh summit representing over 100 gurdwaras and organizations formally appointed five representatives to attend the “Sarbat Khalsa,” a global convocation held on Nov. 10 in the Punjabi city of Amritsar to discuss leadership selection processes and other issues of concern to members of the Sikh religion. Two — Harinder Singh and Resham Singh — now face sedition charges in India for attending the religious congregation. Both are U.S. citizens. Harinder is a prominent voice for human rights in his community and serves as CEO of Sikh Research Institute. Resham is a small businessowner from California, while two other American-Sikhs also slapped with sedition charges by Indian authorities are Surjit Singh, a taxi driver, and Gurbhej Singh, a well-known preacher focused on encouraging Sikh youth to reject drugs, gangs, and follow a religious path. All three work closely with Shiromani Akali Dal (Amritar), a Sikh political party headed by Simranjit Singh Mann, who is also charged with sedition. It is unknown how the cases against the four American Sikhs will proceed as the U.S.-India extradition treaty prohibits extradition for political offenses. Disturbed by mass arrests of the Sarbat Khalsa attendees and indignant at India’s sedition charges against U.S. citizens, Sikhs in the United States blame the arrests on Indian interference in their religion. “Sikhs in India, the birthplace of our religion, are being totally denied any freedom of religion,” says Balbir Singh Dhillon. Now the president of West Sacramento Gurdwara, he was in 1996 jailed by Indian police for three months while traveling in Punjab as a U.S. citizen. Held without charges, it took appeals from dozens of congressional representatives for India to admit he had committed no crime and release him, but he says his memories of being tortured in custody increase his concern for the imprisoned Sikhs. Reports suggest the religious summit drew as many as 750,000 Sikhs from around the world. Bhajan Singh calls it “a million-Sikh march.” The congregation passed thirteen resolutions that included replacing the Jathedars (priests) of its Takhts (sacred seats of authority) with interim appointees, scheduling another Sarbat Khalsa in April 2016 to select permanent Jathedars, agreeing to seek “Vatican-like status” for Harmandir Sahib (the holiest Sikh shrine also known as the Golden Temple), and voicing concerns about several human rights issues. Lasting a full-day on Nov. 10, the congregation dispersed peacefully, yet the next day the Indian government reacted with mass arrests of Sikh leadership, including clergy, politicians, and even a journalist. Along with four American Sikhs and 14 Punjabi Sikhs, authorities in India have registered sedition charges against Sikhs from Italy and the United Kingdom. India’s sedition law has long faced strong international criticism. Section 124a of the Indian Penal Code, which defines “sedition” as any act or attempt to “to bring into hatred or contempt, or… excite disaffection towards the government.” However, it Amnesty International warned in 2014: “India’s archaic sedition law has been used to harass and persecute activists and others for their peaceful exercise of their right to free expression.” Punishing sedition with up to life imprisonment, Section 124a was infamously used by the British to detain Hindu preacher Mohandas Gandhi; more recently, it has been invoked against people like cartoonist Aseem Trivedi for drawing a cartoon satirizing India’s national emblem and Salman M. for not standing during the playing of India’s national anthem in a movie theatre. 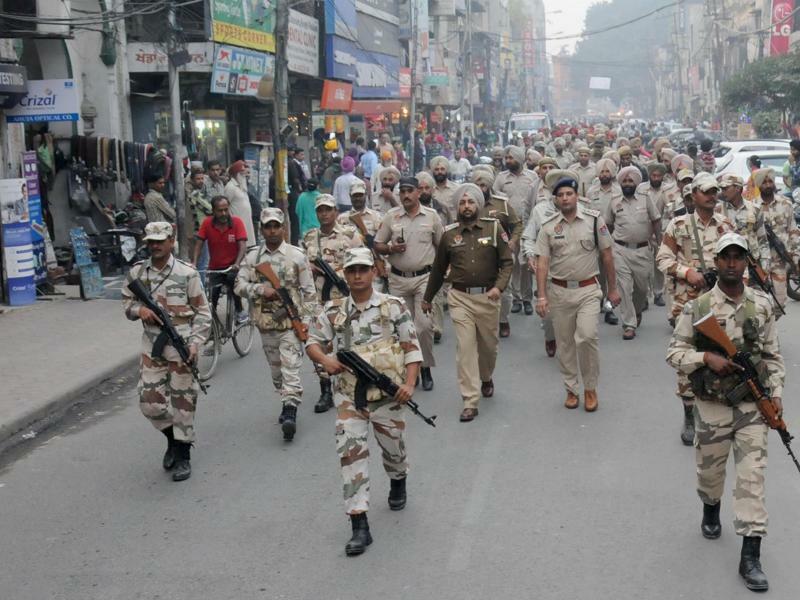 Indian security forces march through the streets of Punjab after Sarbat Khalsa. Amritsar, Punjab: Nov. 12, 2015 — The preventative detention on Nov. 11 of several key Sikh leaders and a journalist by Indian police at the conclusion of a global convocation of Sikhs called “Sarbat Khalsa” is a cause for concern among some who see it as an indication of government interference in their religious affairs that they fear may result in the torture of those arrested. Those arrested in Amritsar and surrounding areas of Punjab include Simranjit Singh Mann (president of political party Shiromani Akali Dal – Amritsar), Mokham Singh (president of political party United Akali Dal), Dhian Singh Mand (newly elected proxy priest of Akal Takht, the Sikh religion’s governing institution), and Surinder Singh (a journalist with Talking Punjab who was providing in-depth, on-location coverage of the Sarbat Khalsa). The Sarbat Khalsa, held on Nov. 10, was called in response to repeated desecration of Guru Granth Sahib, the Sikh scripture, and the resulting massacre by police of peaceful Sikh protesters. Thirteen resolutions passed by the assembly focus on revitalizing the Sikh religion’s leadership by removing four of five Jathedars (priests) of its Takhts (sacred seats of authority), replacing them with symbolic interim appointees, and calling for a more intensive Sarbat Khalsa on Vaisakhi 2016, a festival in April. Gogi, the son of 83-year-old hunger-striker Bapu Surat Singh Khalsa, who completed his 300th day without food on Nov. 11 despite repeated arrest and force-feeding by police, spoke about his father’s struggle from the convention stage. An American citizen, he was released from an Indian jail in April after repeated letters from Congress pled for him. Detained for two months without arraignment, he also reports being tortured. India’s ruling party, the BJP, also shares power in Punjab’s state government. After orchestrating a genocide of Sikhs in 1984, India’s other leading party, the Indian National Congress, finds less popularity in the community, although the BJP is similarly accused of genocidal attacks on Muslim and Christians. The Indian government, under every party, has long faced unresolved charges by international human rights bodies of torture, extrajudicial killings, creation of mass graves, persecution of religious minorities, and other atrocities. Tales of genocide survivors are common among the Sikh diaspora, which includes thousands who claim refugee status. And now the arrest of so many influential Sikhs at the conclusion of the convention is incensing Sikhs outside India. According to Jago Punjabi, the arrests were planned at a Nov. 10 meeting hosted by Punjab’s Chief Minister, Parkash Badal, with key cabinet ministers and the president of Shiromani Gurdwara Parbandhak Committee (the managerial body for the Sikhs set up by the British Empire under its colonial “Gurdwara Act of 1925”), all of whom consulted with Punjab’s Advocate-General, Ashok Aggarwal, and senior police officers about the legality of preventatively detaining Mann and other Sikh leaders. “The world should not stand by silently as peaceful Sikhs are being arrested, tortured, and killed in Punjab for protesting government interference in their religion,” concludes Bhajan. 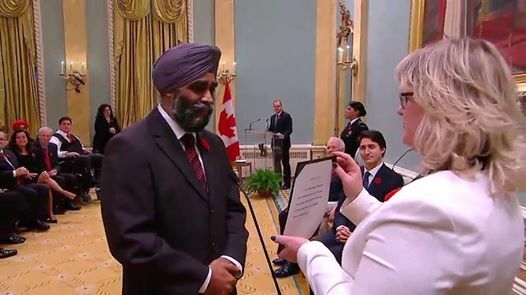 Ottawa, Canada: Nov. 5, 2015 — After Canada’s Liberal Party rode to victory, newly-minted Prime Minister Justin Trudeau welcomed Sikh veteran Harjit Singh Sajjan as Defence Minister, making him the only Sikh in the world to hold such a position. 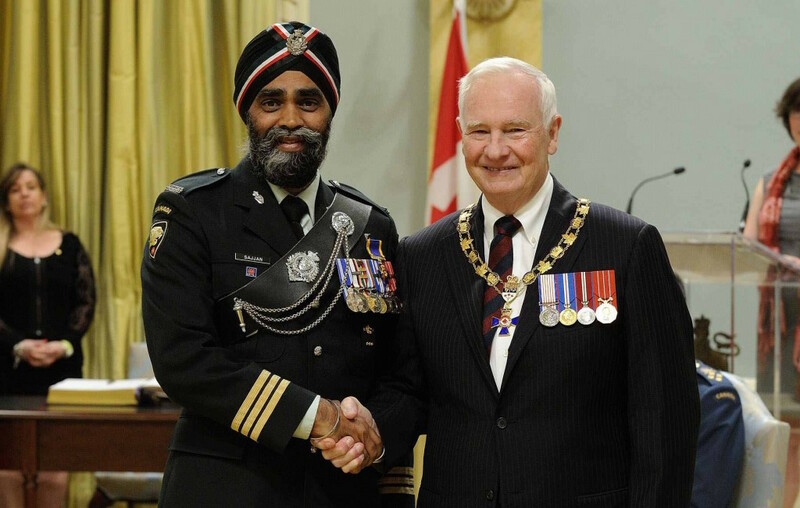 Sajjan, a decorated Lieutenant-colonel in the Canadian Armed Forces, has served abroad four times — once in Bosnia and thrice in Afghanistan — and previously made history in 2011 as the first Sikh to command a Canadian Army regiment. Elected to parliament as a representative for Vancouver South, he previously worked for 11 years as a Vancouver Police Department detective. His Nov. 4 appointment as Minister of National Defence comes after the Liberal Party, upon coming to power, pledged to end Canada’s bombing campaigns in Iraq and Syria; last year, their predecessors ended the country’s participation in the Afghanistan War. “He should concentrate on policy,” remarked retired Brigadier-general Dave Fraser, who tasked Sajjan in 2006 to serve as an intelligence liaison to Afghani politicians. Speaking on behalf of the Conference of Defence Associations Institute, an NGO that promotes informed public debate and discourse on national security and defence issues, retired Colonel George Petrolekas suggested Sajjan should have a “serious conversation” with United States officials about whether or not Canadian troops should play a role in training militants in Middle-Eastern hotspots. Harjit Singh Sajjan takes his oath of office as Minister of National Defence. 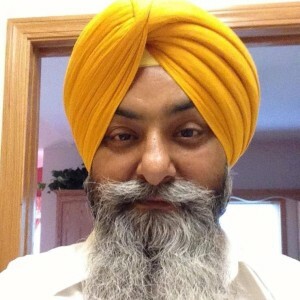 Peoria, IL, USA: August 19, 2015 — Family of Satwinder Singh Bhola (53), who was found stabbed to death in the parking lot of his Peoria, Illinois apartment complex shortly after midnight on Monday, are questioning whether his murder could be related to his father-in-law’s internationally-recognized hunger-strike protest in India. Police have yet to identify any suspects, but robbery did not appear to be a factor as the local newspaper reported that Bhola, a convenience store owner who was returning from work, “had more than $2,000 cash in his pocket and other financial items like a blank check that were not taken during the deadly encounter.” He suffered multiple stab wounds, including one to the neck which appeared to be the fatal blow, perhaps implying the attacker’s intent was to kill. Sikh community leader Bhajan Singh remarks, “My heart is filled with sorrow at this bizarre and bizarrely timed tragedy.” Singh, founder of US-based NGO Sikh Information Centre, urges Peoria police to investigate every possible angle of the case, including potential international dimensions. “While Khalsa’s son-in-law was murdered here in the U.S., his son, Ravinderjit, has personally communicated to me that he is receiving death threats while at his father’s side in India,” says Singh. The ruling party of Punjab, Shiromani Akali Dal (Badal), has faced strong criticism from Khalsa and his family for reacting to his peaceful protest by repeatedly arresting the 83-year-old man. His son, Ravinderjit Singh, a U.S. citizen from Northern California, was also arrested, held without trial for nearly two months, and beaten in custody. Their treatment prompted nine U.S. congressional representatives to request Secretary of State John Kerry’s intervention. Meanwhile, the SAD party was recently protested during a public relations tour of North America; in New York City, for instance, Punjab’s Minister of Non-Resident Indian (NRI) Affairs Tota Singh was struck by a shoe derisively hurled by an angry Punjabi-American. Satwinder Singh Bhola leaves behind his wife, Sarvarinder, and three children. Like his father-in-law, Bhola came to the United States as a refugee from political and religious persecution in India. As patrons of the American Sikh Congressional Caucus, and members of the community the caucus represents, we urge the 42 U.S. representatives who belong to the caucus to recognize and represent the interests of the Sikh-American community by acknowledging the democratic protest of Californian Sikh Surat Singh Khalsa, a permanent resident of the United States who is on hunger-strike in Punjab, India to demand release of political prisoners. Khalsa, like many Sikhs in the United States, came here as a refugee from political and religious persecution by the Indian State. He quit his job as a government teacher in June 1984 after the government launched an invasion of the Sikh Golden Temple that resulted in the deaths of thousands of innocent Sikh pilgrims. After the state-sponsored genocide against Sikhs expanded in November 1984, when the ruling party armed, funded, and guided the systematic slaughter of thousands of Sikh men, women, and children in the streets of India’s capital city, Khalsa began participating in peaceful protests against the government’s policy of genocide. He was wounded when police opened fire on a demonstration outside the Punjab Legislative Assembly in 1986 and subsequently decided to flee India for the United States. He came here legally, and his children and grandchildren became citizens, but he never forgot the atrocities committed against his fellow Sikhs. In January, Khalsa traveled to Punjab to begin a hunger-strike. His demand is for release of political prisoners who are mostly dissidents arrested for protesting the Sikh Genocide and related events. The prisoners have completed their sentences but are being denied release because of the political nature of their charges. Since January 16, Khalsa has refused all food. He was arrested and force-fed for 74 days (February 8 to April 23), but after pressure from seven California congressional representatives, he was released without charges and has now been without sustenance for the past month. His family reports from India that he has lost the ability to walk or even talk. In his democratic protest by abstention, Khalsa joins the ranks of other human rights activists in India like Irom Sharmila and Bhagat Singh. His struggle was undertaken as a method of expressing peaceful dissent and exercising the natural human liberty to free expression and consequently we urge you to recognize his honorable choice. Considering a caucus exists to pursue common legislative goals in service to a specific community, we insist that the most urgent priority of the American Sikh Congressional Caucus must be to speak for Surat Singh Khalsa. His struggle is mobilizing and inspiring the Sikh community all around the world and if the Sikh Caucus claims to represent the interests of the Sikh people, then it cannot continue to ignore this issue. We want the Sikh Caucus to stand up for their constituents who have brothers and sisters that are suffering in India and who are deeply concerned for the welfare of their global community, especially including U.S. permanent resident Surat Singh Khalsa. A number of Sikh Caucus members joined the bipartisan House Resolution 417 introduced in 2013 by Reps. Joe Pitts (R-PA) and Keith Ellison (D-MI), but the caucus unfortunately missed the opportunity to make the resolution part of its agenda despite broad national support for it from the Sikh-American community. We hope you can redeem this opportunity to speak for Surat Singh Khalsa. We appeal to you speak out so that Khalsa’s self-sacrifice for the sake of the human rights of Sikhs, Muslims, Christians, and the oppressed classes of India will not go unrecognized. Please contact U.S. Secretary of State John Kerry immediately to request he appeal for the release of Indian political prisoners. We suggest that no other issue should take precedence for the Sikh Caucus since, after all, the name only fits if the caucus represents the interests of the community by whose name it calls itself. Patrons of the Sikh Caucus is a nonpartisan group who want their congressional representatives to boldly speak out about Sikh issues of true interest to the Sikh-American community, both domestic and international and specifically including human rights issues in India, and who urge the Sikh Caucus to request these issues be adopted into the agendas of the House Foreign Affairs Committee and the Tom Lantos Human Rights Commission. The month of April 2015 marks one hundred years since the beginning of the Armenian Genocide, a multi-year, state-sponsored ethnic cleansing of non-Muslims, especially the 3,000-year-old Armenian community, from the Turkish Ottoman Empire. As the 20th century’s first systematic and targeted slaughter of a specific people group, the atrocity inspired the coining of the term “genocide.” Blanket impunity for the Armenian Genocide, which left a calculated 1.5 million or more Armenian Christians (as well as members of other minority communities living in the Ottoman Empire), dead at the hands of state actors, set the stage for modern struggles to hold the powerful accountable for their oppression of the weak. Many communities have since suffered similarly horrifying genocides at the hands of the State, most notably the Jewish people subjugated and eliminated by the Nazi regime in Europe. While the Nazis were punished and are today excoriated for their crimes, more modern genocides perpetrated against minority religious communities in South Asia, especially against Sikhs in 1984 and Muslims in 2002, bear striking similarities to the Armenian Genocide as the perpetrators have received not only impunity but actual reward, promotion, and increased power as a result of dipping their hands in the blood of innocents. The Armenian Genocide officially began on April 24, 1915 (known today as “Red Sunday”) with the arrest of approximately 250 of the most prominent Armenian public figures — clergy, journalists, poets, teachers, attorneys, businessmen, and statesmen — from their homes in Constantinople, the capital of the Ottoman Empire. Those arrested were imprisoned, held without charges or trial, and most killed in custody. Red Sunday resulted in the decapitation of the community leadership of the Armenian people. Some of the Armenian community leaders killed after “Red Sunday” of April 24, 1915. Subsequently, the ruling party passed the “Temporary Law of Deportation,” using national security as an excuse to label non-Turks as enemies of the state and organize their liquidation. The State began rounding up all Armenians and forcing them to death march hundreds of miles across the desert, usually without food or water, to a network of 25 concentration camps. There they were starved to death or simply slaughtered and then buried, tens of thousands at a time, in mass graves. Armenians who were not deported were murdered by death squads who, according to History.com, “drowned people in rivers, threw them off cliffs, crucified them and burned them alive.” In many cases, Armenian women were raped and forced into harems or taken as slaves, while children were kidnapped and forcibly converted to Islam. The goal of the genocide, which lasted until 1923, was the creation of an artificially homogenous population. That is, the ruling party sought to fabricate the Ottoman Empire as an ethnically-pure land of Turks through the practice of state-sponsored racial and religious supremacy. By the early 1920s, when the killings had mostly ended, the Ottoman Empire’s original population of two million Armenians was reduced to just 388,000. Today, historians, human rights organizations, and governments around the world generally acknowledge the deaths of 1.5 million Armenians. As of the centennial of the tragedy’s genesis, 26 countries have officially recognized the genocide. “Our obligation is to bear accountability. The Germans, from their own familiarity, call upon others to face their own history, even if it is painful; this is the condition for reconciliation between the Armenian and Turkish nations. “The Germans, who placed alliance with the Ottoman Empire above human lives, had their own guilt in this genocide. To this day and to its great discredit, the government of Turkey refuses to recognize the genocide perpetrated by its predecessor state, the Ottoman Empire. Indeed, Turkish law even criminalizes referring to the events that began in 1915 as “genocide.” While the Armenians of yesteryear were (prior to their elimination) subjected to denials of religious liberty through laws imposing social and political restrictions on non-Muslims, the Turks of today are subjected to denials of free speech. While the Armenian Genocide has gained wide recognition among the world’s nation-states, Sikh Information Centre has found inspiration in the example of the Armenian diaspora to join a number of Indian diaspora groups, including American Sikh Political Action Committee and Organization for Minorities of India, to secure recognition of the 1984 Sikh Genocide and other atrocities in India by Western municipal and state governments. On March 10, the Central Californian City of Stockton, home to the oldest permanent settlement of Sikh-Americans, passed a proclamation condemning the 1984 Sikh Genocide, with Mayor Anthony Silva declaring: “We commemorate the 30th anniversary of the 1984 genocide as we recognize the ongoing impact of the genocide for the Sikhs around the world and our city.” California’s State Assembly followed suit on April 16, unanimously adopting a resolution to remember the “1984 anti-Sikh pogroms,” making it the first state or national government in the world to formally acknowledge the tragic event. Sikh Community leaders pose with City Council of Stockon, CA after accepting 1984 Sikh Genocide Proclamation. STOCKTON, CA, USA: April 13, 2013 – Ravinderjit Singh Gogi, a U.S. citizen from Central California, has been jailed in Punjab, India since February 26, but despite repeated appeals from his family, local community leaders, and a human rights group, the U.S. government has so far failed to even acknowledge his detention. Ravinderjit Singh Gogi in police custody; at left is the police officer accused of beating Gogi. Gogi is charged with India’s Criminal Procedure Code sections 107/151, which allow police to arrest a person if they think he is “likely to commit a breach of the peace.” Although Gogi did not actually breach the peace, police used the law to arrest him under suspicion alone after he visited his father, Surat Singh Khalsa, in the hospital. Khalsa was engaged in a hunger-strike for the release of Sikh political prisoners when he was arrested and forcibly admitted to the hospital. On Monday, Gogi’s sister Sarvinder Kaur, also an American citizen, reported from Punjab that she witnessed police beating her brother while he was waiting in a detention cell for a court hearing. Gogi, who was in chains at the time, was reportedly shoved into the cell and beaten on his neck and back with fists. His attorney, Gurjinder Singh Sahni, states Gogi now has severe bruising, is suffering intense pain in his neck, and is seeking medical attention. Sikh Information Centre has coordinated with Organization for Minorities of India and the leadership of Turlock, Stockton, and West Sacramento Sikh Gurdwaras to sponsor two press conferences calling for Gogi’s release. On March 12, West Sacramento Gurdwara and Stockton Gurdwara hosted a joint press conference in West Sacramento to call for Gogi’s release. Balbir Singh Dhillon, president of West Sacramento Gurdwara, explained how he was similarly unjustly detained in Punjab in 1996, saying: “I went to visit all the holy places in India and Pakistan. Police were looking for me. I was sent to jail for three months, in prison, in Punjab. There was no bail.” Balbir was released only after over 50 US congressional representatives signed a letter to the US State Department that pressured India to admit it had no proof he committed any crime. The State Department must intervene immediately, warns Bhajan Singh, who says: “I fear for Gogi’s safety and even his life if the government continues to ignore the desperate plight of this unjustly imprisoned American citizen. Congress already missed the chance to act against the severe persecution of minorities in India by failing to pass House Resolution 417 in 2014 despite broad bipartisan support for the resolution.” House Resolution 417 proposed the U.S. Congress “denounce harassment and violence against religious minorities” in India, but even with 51 cosponsors it was denied a hearing in the House Foreign Affairs Committee. Lodi: Jan. 31, 2014 – Based on conflicting reports of the events leading up to Lodi, CA police officers shooting to death US Army veteran Parminder Singh Shergill, 43, on Saturday morning, the San Joaquin County Sikh community is demanding a comprehensive investigation to uncover any possible misconduct. Shergill, who served in the first Gulf War, was reportedly suffering from Post-Traumatic Stress Disorder. His mother, concerned for her son and seeking his admission into a Veterans’ Affairs hospital, called police early Saturday morning to request their assistance. Police claim Shergill was holding a knife and standing outside his family home when they arrived on scene. Lt. Sierra Brucia, a spokesperson for Lodi Police Department, says, “The man charged at the officers, and they had no choice but to shoot.” An eyewitness to the scene, however, tells a very different story, claiming Shergill did not charge officers and may have even been moving away from them when they opened fire. Vidal was an 18-year-old from Boiling Spring Lake, NC, who suffered from schizophrenia. On January 5, when Vidal experience a schizophrenic episode, his parents called police, hoping they would help subdue the boy to get him to the hospital. When police arrived, they found Vidal holding a screwdriver; like with Shergill, however, he did not threaten anyone with the object. Police demanded he drop the screwdriver, Vidal retreated, and police joined the boy’s step-father, Mark Wilsey, in successfully subduing him. However, once Vidal was subdued, one newly-arrived officer said, “We don’t have time for this,” drew his gun and opened fire, killing the 90-pound, mentally ill boy. Shergill graduated from Lodi High School in 1989 and joined the Army, assigned to the infantry division. After spending two years in Germany, he served in Iraq during the Gulf War. He served in the Army until 1995, when he was dishonorably discharged. A graduate of California Statue University, Sacramento, where he studied biochemistry and electrical engineering, at the time of his death Shergill worked at Pacific Coast Producers as a control room operator. Bhai Gurbaksh Singh Ji smiles on the 41st day of his fast unto death. In the gift of Bhai Gurbaksh Singh Ji, we are assured that someone will yet call for justice, plead for truth, and lay down his life to take up the cause of the oppressed. In a land of midnight where politicians are thieves and murderers who conspire with priests to control and destroy so they may satisfy their greed and lust, Gurbaksh Singh is a spark of hope that oppressors may yet be overthrown by the fervent supplication of the oppressed. As the offspring of evildoers, Delhi’s dictators conceive evil continually, their feet make haste to shed innocent blood, their joy is in fashioning the fatherless, their delight is in creating widows, and their highest ambition is to see India remain heavy laden with iniquity. Because the tongues of India’s tyrants mutter perversities, because their hands know only violence, and because hatred alone springs forth from their hearts, so their days are numbered. Though the peaceful and patient resistance to tyranny chosen by Gurbaksh Singh shall bring us to mourn as we may soon see him pass into the presence of God, the gift of such a divine oracle as this pious man brings hope that the sun may yet still rise upon a land of darkness. Though today the hands of Indian rulers are defiled with blood and their lips speak lies, Gurbaksh Singh reminds us that deliverance does not stand far off. We remember through his decision to make his life a prayer for the whole of humanity that there is a light shining in the darkness. Time alone will tell when the rulers of India will cease to do evil, relieve the oppressed, and choose to love the darkness after having seen the light of love in the willing sacrifice of Bhai Gurbaksh Singh Ji. Until such a day arrives, however, we rest in the firm conviction that the sons of those that afflicted the oppressed shall one day come to them on bended knee. A UN Human Rights Day statement from Sikh Information Centre Founding Director Bhajan Singh Bhinder. After speaking to approximately 200 protesters at Tuesday’s “Rally for H.R. 417” outside the San Francisco Consulate, Bhinder gave the following statement. “There is always a ray of hope. Humanity survives on hope. If there is no ounce of humanity, there is no ounce of hope, then there will be total despair and chaos, which the vast majority of the world gets caught in…. House Resolution 417 is one of the most strategic, most important, landmark resolutions. It simply wants to remind U.S. and India that, in their quest for a better relationship, they should not ignore the plight of the minorities of India.